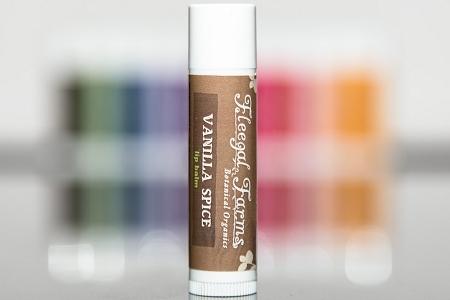 Lip Balm - 0.15oz Scented with vanilla and cinnamon, this sweet balm is a favorite for many. Almost like homemade cookies, this balm fills my shop with it's delicious scent on the day I make it. It's silky texture helps to sooth dry lips or use just to keep them happy. Our lip balms contain no petroleum products, only vegetable oils to sooth your lips. They come in nine flavors: Lavender Hemp, Mint, Sweet Orange, Vanilla Spice, Strawberry, Coconut Lime, Honey Almond, Pumpkin Spice and Fragrance Free. INGREDIENTS: oils of olive (olea europaea), organic extra virgin coconut (cocos nucifera), flax seed (linum usitatissmum), castor (ricinus communis), shea butter (butyrospermum parkii), beeswax, candellia wax, vit e (natural tocopherol), zinc oxide, stevia extract (eupatorium rebaudianum bertoni), cinnamon and vanilla essential oils.